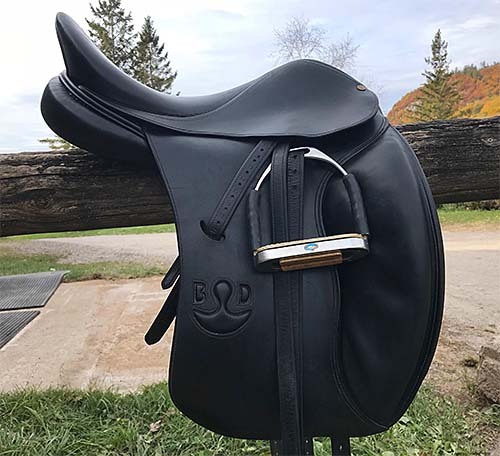 Bruno Delgrange Babylone dressage saddle in pristine condition with very little use, medium tree, 17,5 semi-deep seat and size 4 flaps. No scratches, always cleaned and protected with the cover, impeccable maintenance. This saddle is VERY comfortable both for the horse and rider. 3750$ CAN with the original cover, stirrup leathers/stirrups and the Delgrange soap/oil kit. 3600$ CAN for the saddle without the kit. Located in Gatineau/Ottawa area. Pictures available upon request.